There’s a vibrant scene brewing in the United Kingdom and today’s “Five Questions With…” takes us to Manchester with The Empty Page. 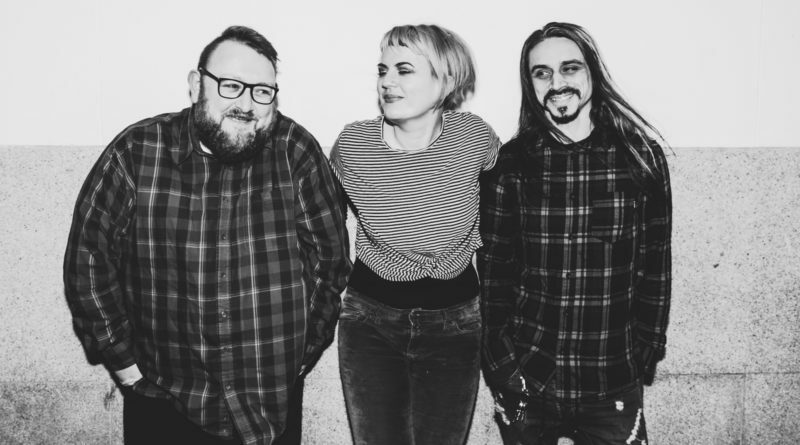 The band draws influence from 90’s alternative and its debut record, Unfolding, could fit right at home in that era but rests comfortably in the present in the company of bands such as Bully, Yuck, Speedy Ortiz, and Wolf Alice. All three members contributed to this week’s post: Kel (Vocals & Bass), Giz (Guitar), and Jim (Drums and backup vocals). 1. What is your desert island disc? Jim: Hatful of Hollow by The Smiths. Every single track on it is sublime, and even though it’s not technically an album, I’d consider it to be the greatest thing they’d put out. Giz: I couldn’t choose just one! I guess Raw Power by The Stooges is an album I think is pretty awesome. Loads of attitude and noisy guitars. Kel: We met when the old bands we were in kept playing shows together and we realised we had a lot in common musically and the same filthy sense of humour. Jim: Yeah, with us all playing in other bands around Manchester we were bound to bump into each other sooner or later. Out of the blue, Kel and Giz got in touch asking if I fancied jamming some 90’s covers and that was it really. Giz: I’ve known Kel for years we played in a band together before The Empty Page. Kel wanted to play some bass and jam some covers just for fun and we needed a drummer to jam with so we asked Jim mainly cos he was available on Thursdays in the daytime. When we discovered we were terrible at playing covers we started writing our own stuff and here we are! Kel: We live in a big music city, Manchester, which has a rich heritage of interesting bands like The Happy Mondays, Joy Division, The Smiths, The Stone Roses, The Fall… so there are a lot of musicians and a lot of creative people generally here. There are lots and lots of venues putting on lots of different types of bands. You can watch a good band any night of the week. So it’s thriving! Jim: It’s great. There are so many brilliant alternative bands around Manchester at the minute and the great thing is everyone is really cool. There’s no arrogance or competition. We’re always bumping into other band members at other band’s shows. Giz: There’s always loads of good bands playing original music, you’ve just gotta go find them. Manchester has always been a great music city with lots of local bands and touring venues. Giz: Outside of music probably art inspires me the most but fashion, poetry, so many different things! Kel: I love reading and as a lyricist, I am influenced a lot by poets, writers and novelists. I have always snuck literary references into lyrics. I watch quite a lot of movies too, and am inspired by stories and the human condition in general. I get a lot of lyrical ideas from overhearing snippets of conversation on the bus, from stories I read in the newspaper, and from my own experiences of course. If you’re open to it you can get inspiration everywhere! Jim: I always feel like David Brent saying this but it’s British TV sitcoms. I’m quite geeky about them but I’m not arsed in the slightest. Oh and my kids. I have a one year old and six year old who is easily the funniest person I’ve ever met. Jim: A few stick out but I suppose i’d say the gig at The Ritz in Manchester. We all used to go to the Ritz to a clubnight on Monday nights there in the 90s. Everyone into alternative music went. Everyone. It turned me on to loads of other music, cultures, people, colours, clothes, drugs – everything. It shaped us all. Twenty-odd years later we end up playing the kind of music we’d have danced to on stage there. Kel: That’s another difficult one as I have played lots of cool shows with lots of different bands over the years. To be honest, I really loved our album launch party in Manchester. It was a pretty small venue but we sold it out and it was just a great atmosphere. On the whole, I prefer small, sweaty shows packed full of people that really love the music. Giz: I’ve played so many gigs it’s hard to say. The empty page went to Canada last year and did 4 gigs in 5 days, that was pretty awesome to go somewhere random and have a crazy adventure as a band. We’re hoping to do more of that next year!